Could you fit in the seat at Fenway Park? This has always been my fear—that 90 percent of folks who read my site and books think that a green drink covers all their sins. It does not work like that for most. Green smoothies are nothing more nor less than a step in the right direction. Since I last wrote, my son and his team have won FOUR more games in the state tournament, and last night they won the semi-finals. I almost had a heart attack myself, in several times in close games. 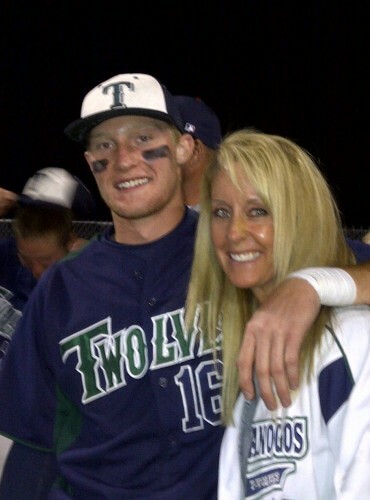 It’s stressful to be the mom of the pitcher! Tuesday he brilliantly threw a 2012 team record 131 pitches in 7 innings, to win a very tough game. Pitchers ideally need 5 days of rest before they pitch again. Cade will get only 2 and pitch today. It’s been great fun to cheer my voice out with dozens of other moms wearing our son’s white jerseys, and enjoy the company and support of my family, many of whom are making sacrifices to be there for my boy. My friends are driving my car to Las Vegas this afternoon, where we have Van Halen tickets. I won’t be with them and will try to hop a plane later. A team of wild horses couldn’t drag me from the game today. Anyway, I hardly ever see Glen, father of six and a partner in a law firm. We were talking about how goofy the hand-flipped scoreboard is, in this beautiful multi-million dollar high school stadium. It’s like they ran out of money at the end. But on the other hand, it reminds us of Fenway Park, a place he loves, where I toured with my kids two years ago. I have never bought any of those things at any baseball game. Not once. The key is to plan, to shop, to always take your own food, and to simply be committed. For eight cold, sometimes rainy hours of baseball the past couple of days, I took green smoothies, pints of vegetable juice, a bag of homemade chips that are just quartered organic corn tortillas, broiled, and a tub of homemade guacamole mixed with chopped tomatoes and black beans, and Just Great Stuff bars. Tennyson and I shared it all. I did calisthenics during a freezing cold double header to keep warm. The ump turned around and laughed at me and told the catcher (I learned later), “I’m going to retire from baseball now and just watch this girl doing jumping jacks.” Between that and the food, well, I don’t care—yeah, I’m weird. I own it. I don’t want to go home elated at two back-to-back wins, but feeling physically heavy and sick. If you must dig yourself out of allergies, acid reflux, and ugly numbers like 170+ blood pressure……change and commitment are needed. That is where the wellspring of commitment is. It is in the deep places in you. Value your life enough to save it, to make it great instead of just functional. Start a SERIOUS journey to whole foods with us and give it a month on 12 Steps to Whole Foods recipes only. Then let me know how you feel. You’ll feel very, very different. You can overhaul most of the cells of your body in that time! Or, soon we will launch our 26-day detox, which Kristin says “has changed me and how I see food.” She says today she feels like she has “swallowed the blue pill and can’t go back.” More about the detox later. We are out-of-our-minds excited about it. “You’re going to have to choose—between junk food addiction, and quality of life.” — BRILLIANT! I’m 27 and have felt LOADS better (especially digestion-wise) since starting green smoothies in Feb 2011. My little boys love it – ages 3 & 6 now (the 3 yr old prefers to steal drinks from my cup instead of having his own). DH is happy to drink it too. We love it with berries+1/4 lemon peel or strawberry+mango. The flaxseed oil helps me get the valuable Omega 3s. However, it wasn’t until I cut from my diet all sweeteners, gluten, dairy, hydrogenated fats, and artificial dyes/flavors/preservatives, and “natural flavoring” including free glutamates like MSG, that my weight started melting off (I was almost 220 pounds) and my energy skyrocketed! I used to have to take a nap with my toddler everyday to make it through the day. And the best part is now I have the energy and enthusiasm to be the mom I want to be for my sons! Thank you SO much Robyn!! O.K., now you have us really anxious for the unveiling! Can’t wait for the 26 Day Detox. Yeah, Kristin! So happy to hear that you love it. How I would love to reach my family with this message. They just think this is all so unnecessary. Keep up the good work girls! The word is getting out and we aren’t as weird to the masses as we used to seem. 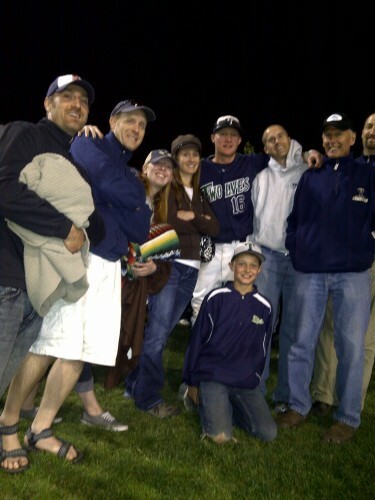 timpanogos up 12-0 in the 5th…looks like someone will be staying for the “if” game at 7 pm tonite and missing van halen. Eric, wow, you were on it…..yes, my boy pitched that 12-0 game. I still can’t really write or talk about what happened in the next game—for now, suffice it to say it was a highly emotional event, and yes I did not go to Vegas with my gf’s, although I hopped a plane the next morning. In April I attended one of your classes in San Francisco (where I live) and it was wonderful. You mentioned eczema and steroids. My baby is 9 months and has had bad eczema and severe food allergies to wheat and barley and has been prescribed steroids as well. I refuse to give them to him, but I would like to know if what is bad? I feed him hypoallergenic formula (unfortunately he didnt breast feed well, long story) also you madea green smoothie at your class that was delicious and my baby loved it, could you tell me what was in there again? I am going to start making them! also, I am curious about greek yogurt.. it seems its the the huge thing these days.. is it really good for you? the plan non sugar kind of course.. Thank you!! !